Egypte Nubie et Abyssinie avec une partie de l'Arabie et du Sahara. 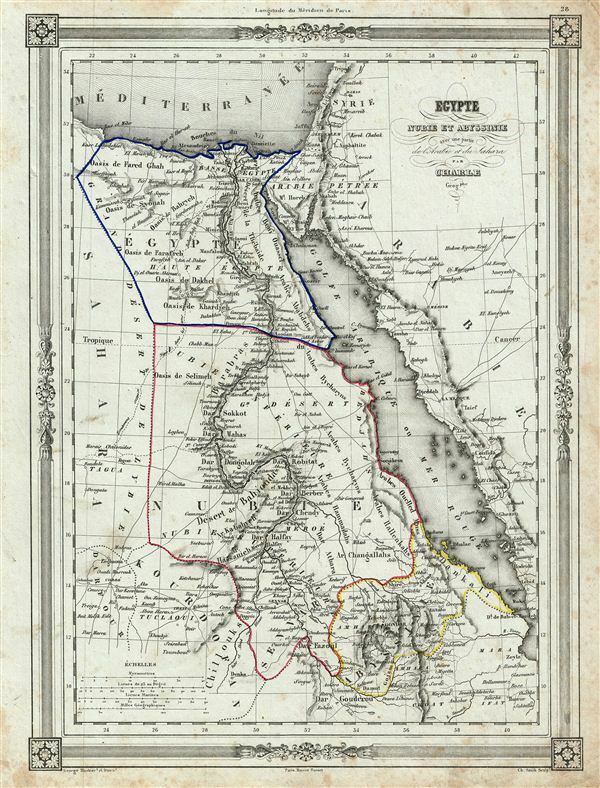 An uncommon and extremely attractive 1852 map of egypt, Nubia and Abyssinia. The map covers the lower Nile Valley including egypt, Nubia and Abyssinia (ethiopia), as well as the adjacent Arabian Gulf or Red Sea, parts of Sudan, Arabia and the Sahara. Throughout, the map identifies various cities, towns, oases, deserts, rivers and assortment of additional topographical details. The map depicts a time in egyptian history following the expulsion of the Napoleonic forces from egypt by the Ottoman Mamluk Turks. Muhammad Ali, the Ottoman commander who was named viceroy of egypt established the Mamluk dynasty that would rule egypt until the egyptian Revolution of 1952. Between 1820 and 1833, Ali annexed northern Sudan, Syria and parts of Arabia into the Mamluk empire. In 1848 Abbas I, his grandson, was ruler of egypt and Sudan. Abbas I, who spent most of his time in seclusion, on the insistence of the British government, was responsible for the construction of the railway from Alexandria to Cairo. The map features a beautiful frame style border. Prepared by Charle for publication as plate no. 28 in Maison Basset's 1852 edition of Atlas Illustre Destine a l'enseignement de la Geographie elementaire. Jean Baptiste-Louis Charle (fl. c. 1800 - 1850) was a prominent French Geographer active in the early to mid 19th century. His is known to have worked with Victor Levassuer, Lapie, and others. Despite a large corpus of work, little is known of Charle's life.